Last September when I praised "How I Met Your Mother" star Neil Patrick Harris for making an appearance at the 2007 Emmy Awards with his boyfriend David Burtka, I also noted how normally dateless "Grey's Anatomy" star T.R. Knight appeared with a female companion. Well, things have changed. 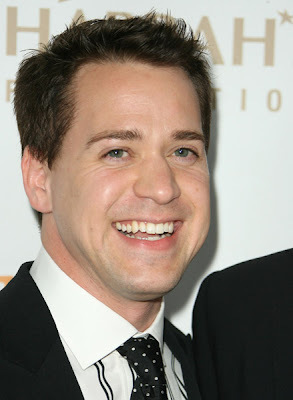 On Saturday night, out and proud T.R.Knight walked the red carpet with his young boyfriend Mark Cornelsen. Knight, who came out in a People Magazine article in October 2006 following an on-set incident with shamed co-star Isaiah Washington, used the opportunity to speak of the recent murders of teens Lawrence King and Simmie Williams Jr, who were killed earlier this year because they were gay. During the show, Knight also blasted homophobic republican Oklahoma state representative Sally Kern, who has come under fire after it was revealed that in a recent speech she compared gays to terrorists and said she believed that the "homosexual agenda is destroying this nation." 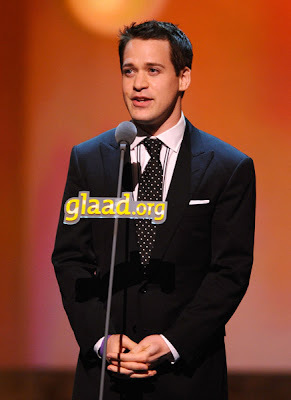 "I am realizing more and more how privileged I am to be able to use my voice to support an organization like GLAAD," Knight said. "I will continue to do so until the Sally Kerns are taught the real teachings of Jesus Christ." The openly gay "Grey’s Anatomy" star has recently signed on to participate in the National Day of Silence ceremony at the Miguel Contreras Learning Complex in Los Angeles, an event sponsored by the Gay, Lesbian and Straight Education Network (GLSEN) to help combat bullying and harassment of gays in schools.